looking at the car .. Along with the photo was a slip of paper with "Dickie Shepherd-Barron's Morgan +4"
Based upon this, I looked into results online, RS-B was entered in the 18th August 1962 Goodwood Tourist Trophy in the 'Morgan Motors' team, running car number 31, DNF. The trackside tower in the distance looks like the BP tower which shows up in contemporary shots of Goodwood. Another question, as a novice in +4SS matters, was it usual to have reversed louvres on the air inlet? Yes, the louvres are correct. I have the set of 2 books named: A record of motor racing at Goodwood by Robert Barker.. This book is fenomenal if it comes to information about all the races ever at Goodwood. I checked the date 18th of August 1962. At 3.00 pm that day there was a 100 lap race: 27th RAC Tourist Trophy. With Le Mans start. Start number 31: Richard Shepherd Barron, Morgan +4 (no reg. number mentioned) the car broke down in lap 35. Start number 33: Chris Lawrence Morgan +4 (TOK258) ended 8th after 89 laps. What you see that they never talked about Morgan +4 SUPER SPORTS!! They annouced them as +4. What's, to my opnion, is correct. Bill, and all others who read this: If you have the possibility to come to the SPARE FAIR, Abbey Hotel, Malvern: Date: 26th of February. Starts: 10.00 am. The Morgan Historic Register has a stand! We love to meet you there!! Well, the start number is correct if you compair it with the records I have of that race at Goodwood: 18th of August, 1962. That's 2 months after Le Mans! How interesting this all is! Do we see you at the Spare Fair? 26th of February. Abbey Hotel? Bill was to kind to make a good quality scan of the photo he showed us. I made a print of it. After that I went to my archive to put that print in it. There I found something interesting about the same weekend at Goodwood. I have another, not very good "photo" with all the 3 Morgans who where in the same team, on it. Some young boys where looking at the cars/ Morgans. "Dickie", - well, all a stupid story. I worked in 1958/59/60 with Thomson & Taylor (Brooklands) Ltd at Cobham and Blyfleet in Surrey. They were then the Alfa Romeo concessionaires for The UK (remember I was racing an Alfa) and as well as the garage at Cobham their works at Byfleet could make literally anything- including the Brooklands Napier-Ralton and John Cobb's car that took the World land speed record after WWII. Many years later, Ron Dennis of McLaren started working there as an apprentice! Not tenuous - Richard SB's brother John was accredited with the invention of the ATM for which he received an OBE. From my notes with interviewing RSB - John was 13 years Richards senior. After school at Stowe, he served during the war with the Parachute Light Regiment. He went to Uni at Edinburgh and Trinity College Cambridge. Their mother,Dorothy, played at Wimbledon 12 times, raced yachts in India and was captain of the Wightman Cup team. Their father, Wilfred was equally distinguished being a past president of the Institute of Civil Engineers (following in the footsteps of Thomas Telford, Robert Stephenson etc). He turned down a knighthood as Dorothy had been killed in a road accident. Did you do the BBC quiz on ATMs? 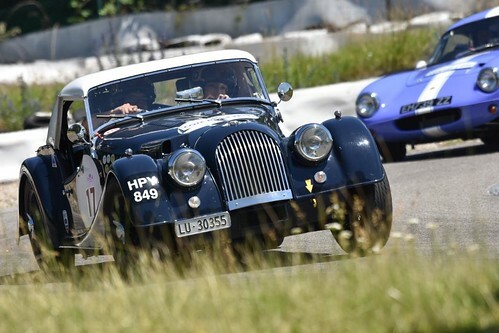 You've probably noticed that my Super Sports has not been seen at the UK tracks of late........because it's now begun a new life in Switzerland! It is being very well looked after by the new owner although it is very sad it had to leave these shores. So perhaps now only 6 (??) Super Sports residing in the UK. We miss you both John! Just bought this photo off eBay, do not have 'The Lawrence Tune Years' (too modern for me) to see if this car was photographed much during it's career in this form. Well, I seem to have missed this thread first time around (or forgotten it). The picture is indeed Goodwood in 1962 and the TT Race. "Early evening sunshine bathes the Morgan Plus Four of Richard (Dickie) Shepherd-Barron after it retired from the race, it was entered by the Morgan Motor Co."
The book is a pictorial record using photographs by Tony Gardiner who went to Goodwood throughout the 1960s as an ordinary spectator, as a result there are many interesting pictures from the paddock (as well as the track) of fascinating race-cars not just the leading names of the time. PS - John, I pleased that your +4 has a new lease of life, but equally sorry it has been lost to our native shores !